Only a little under 2 months now until the 27th of May, so keep you fingers crossed for a full day of sunshine and warm weather. This year’s Fete will be packed with the usual activities including the Dog Show, amazing food, drink and attractions for the whole family. As always we will have a Hog Roast, Vicars Game burgers, and traditional teas. Local ales from West Berkshire Brewery and a Pimm's stall. Maypole dancing by Yattendon School pupils, and not to forget the Kennet Morris Men. All traditional activities for the children, and a vintage and classic car display for the older kids out there. 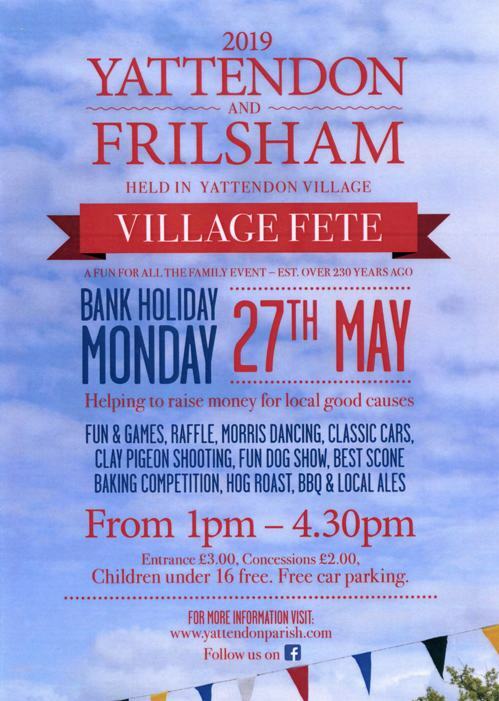 So mark the day in you diary now, as we look forward to seeing you there for a lovely day in the English countryside. All proceeds to local charities – fun for all the family.